Now that spring is in full swing and summer is right around the corner, families are spending more and more time in the great outdoors. One of the places families tend to gravitate to are playgrounds. Playgrounds are great place for exercise and imagination. It is easy to see the smiles from atop of the slides and even hear the laughter from the swing sets. What we don’t see however, are lurking dangers that could present themselves if precaution isn’t taken. According to the American Academy of Pediatrics, approximately 200,000 playground injuries occur in children under age 14. Children ages 5 to 9 had a higher incidence of Emergency Department visits than other age groups, with girls sustaining injuries slightly more often than boys (55 percent to 45 percent). Falls from equipment and around the playground are the most common, resulting in 75 percent of all injuries. Before heading out to enjoy the fun in sun, consider these helpful playground hints. Proper equipment usage goes a long way in injury prevention. Children should slide feet-first down slides, never head-first or backwards. 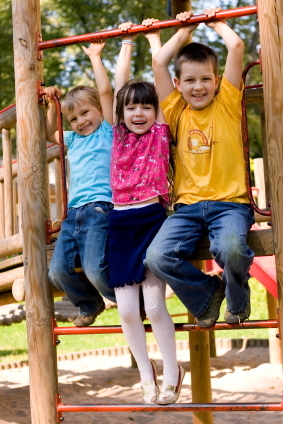 When using swings, children should stay seated and, when exiting, ensure the swing has stopped completely. Children should walk a safe distance from the swing to ensure they do not get struck by others swinging. Proper attire helps impede injury. Parents should remove all necklaces, purses, backpacks, and scarves and stow them away from the play area. Strings on clothing or ropes used for play can cause accidental strangulation if caught on equipment. Whether it’s a backyard play set or public playground, check to make sure the equipment is anchored safely in the ground, all equipment pieces are in good working order, bolts are not protruding, and there are no exposed footings. Equipment should be free of rust, sharp edges, splinters, or missing parts. On really warm days, always check to make sure the equipment is not too hot. Playground surfaces can become extremely hot and can even cause burns on the skin. With a little bit of caution, families can enjoy many days outdoors at the playground injury free.